Feedback was our focus for 2013-2014. We were interested in exploring all types of feedback and trying to discern what worked best for our students. John Hattie's research informed a lot of our thinking as we spent countless hours wondering about what types of feedback would be relevant to our students. What feedback would let us accurately reflect on learning and plot next steps forward? We didn't really have a system or a map as we wandered into this work. We relied a lot on our knowledge of third grade students and followed our hunches about what might work when seeking feedback. Often we were surprised by the depth of our students' capability to reflect and think. 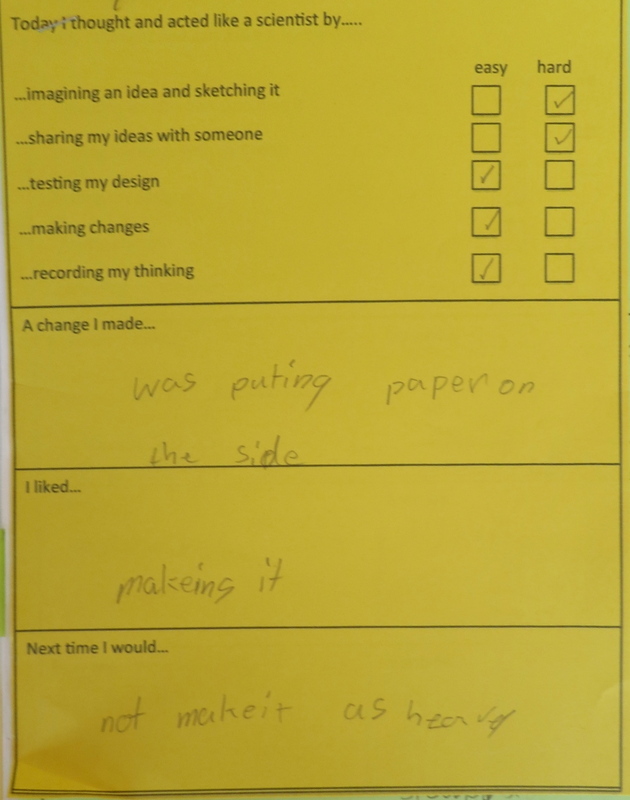 Above are some examples of feedback forms we used to find out more about how our students were processing their design tech experiences. We tried to craft feedback in such a way that we could begin to see a correspondence between effective collaboration skills and successful problem solving. We also wanted our students to visibly reconstruct an experience noting moments of frustration and success to make the process visible for them and to reinforce stamina and persistence. 1. Initially, we wanted to have our students show evidence that they were “thinking and acting” like designers and scientists. We provided some basic scaffolding, (including modelling, accountable talk, and a short reflection form), but quickly realized that we were still just scraping the surface. The students weren’t expressing in writing what we had observed during the activity. We wondered about the disconnect. Were they just doing the minimal to get to recess? Did we miss the boat somewhere? We decided that we hadn’t pushed their thinking enough. We made one simple shift to our form. We added the word BECAUSE and when we asked the students to do some additional reflection the next morning, their second written response was deeper and more succinctly captured their thinking. 2. The second shift in our thinking was our realization that our students were not effectively working in collaborative constructions because they weren’t aware of how group dynamics impact success. They were focusing on the task versus the partnership; they weren’t seeing the connection between the two. In response we intentionally and strategically paired our students thinking about both personality traits and capabilities. We also decided to pair them over a longer duration so they really had to commit to the project and navigate the working terrain. We also adjusted the feedback form, building on previous feedback questions, so the students had to both identify and acknowledge the strengths they bring to a team and the implicit challenges. 3. Our third “ah-ha” was our realization that feedback lenses need to morph in order to keep pushing student thinking and probing their understanding. As the students grew in their ability to reflect, we had to build a bigger container to support them in capturing their thoughts. We shifted our focus onto recognizing traits that an individual may exhibit in a group and asked them to use this information to tell the story of their group experience. We also asked them to tell us how they knew that this was true…the “so what?” We used animal symbols to represent roles and behaviors we often observe in our children when they work collaboratively. We used the animal analogy to springboard their reflection. We thought this might be a stretch but were greatly surprised by the results. Students look at how they contribute to a collaborative process. Our current thinking on this topic as we move forward is that feedback is slippery. You can’t nail it down. Depending on what type of feedback you’re looking for and what the content area is, the feedback mechanisms will need to shape-shift. It’s always a work in progress. The more we know our students, the more we are able to tinker with feedback systems, fostering self-knowledge and opening possibilities for change. We still have a road ahead.